You are having an above ground pool installed and you want to know if getting a water truck is the best option for you. This is a good question and it has a yes and no associated with it. There are pros and cons to having your pool filled with a water truck. 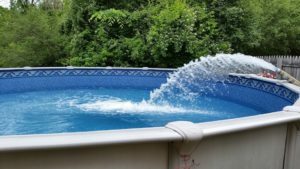 First you should understand how much your pool holds in gallons of water. Please find this following chart useful to finding how much your pool will hold. This is estimating with water level halfway up the skimmer opening. I say this chart is within 200 gallons give or take. Next for your consideration is water delivery tankers hold about 9,000 gallons and roughly cost $375.00 for a local delivery. They do have the ability to get you half of a tanker but the pricing is not 50% less. The pricing is in the range of $225 for a half tanker delivery. The average cost of a typical 24’ round pool (containing 14,700 gallons) with your water hose is going to cost you about $80-$160. 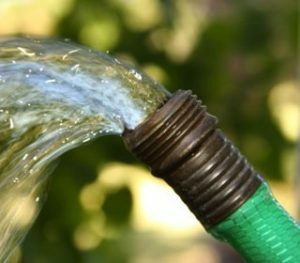 These costs are depending where in the country you live and your local water supply markets. You can get exact numbers by calling your local township and they will let you know your rates. Rates usually include the sewerage charges as well as water usage charges. Many assume it is cheaper to have it trucked in but as you can see this isn’t the case. You may find your local area is under drought control and you’ll need to purchase a water truck anyways. So please give your local government a call to find out. Water tank delivery companies may deliver the water already treated for swimming which can be bonus if purchasing water from a deliver company. Most have this ability and do so but; you will need to call a local company to find out if they treat in your area. Some townships forbid companies from treating water. At the Above Ground Pool Builder we recommend filling with your water hose. Because first reason it will save you some money, everyone likes to save a little money here and there. Second is filling a pool for the first time will give your liner the ability to stretch slowly into place. You’ll get the wrinkles out perfectly. Is this a must to have it filled with a water hose, No, we just like this choice as it also requires less coordinating on your part. Also by filling slowly you will see a manufacturer defect and save water. What do I mean by this? There is a seam on these above ground pool liners that goes around the entire circumference of the pool where wall meets the floor. You only need about 6 inches of water in the pool to test for any kind of seam failure. Please keep in mind this kind of seam failure is rare so one shouldn’t fill with water hose just based on this knowledge. Could you imagine having two water tankers lined up paying $750.00 and finding out you have a seam leak? Although this hardly ever happens it is something to think about. Perhaps having a patch kit for 10$ is a good insurance against manufacturer seam failure.